What Is A Gap In Employment Affidavit? With an exploding population like ours, unemployment is one of the major crises that we are facing as a country. We are touted as an economy on the upswing, but, what we fail to understand is as to why there is such a jobless growth. Year after year we find youngsters passing out with flying colours but, the growing number of aspirants doesn’t match the minuscule or abysmal level of jobs in the country. Unemployment is one such stark reality that we need to come to terms with. With the advancement of science and technology, the need for labour intensive workforce has declined considerably and since work gets automated, there is a serious dearth of jobs for people as companies focus more on high-end technology and automation, and don’t really need people to do works which can be easily automated. Unemployment is a curse which has marred the growth of not only our economy but also of the budding young talent that our young guns possess. Unemployment can also be blamed on the kind of society that we Indians live in. A majority of us are dependent on a few people which make it very cumbersome and a threatening for the future of the society. As you can decipher from the name, a gap in employment affidavit is created by a person, who had been off work for a while and had not been employed anywhere. In India, especially the employment gap is common mainly among ladies, as they are unemployed for certain duration owing to reasons like marriage, childbirth, pursuing higher education or hobbies and passions. Employment gaps can also be for saddening reasons like employee layoffs, retrenchment etc. An employment gap is an eyesore for many, the reasons become difficult to explain and in a country like ours, where employment opportunities are few and far between, it gets very difficult to get a job, that too after a break. An employment gap lays apprehensions in the minds of the prospective employers. More often than not, employers are wary of taking people who have had a break in their careers, you might come across as a complete slacker to them. Well, if you are applying for a job after a considerable break from work then you will be required to submit an affidavit explaining such gap to a potential employer. What To Include In The Employment Gap Affidavit? How To Make The Gap In Employment Affidavit Legally Valid? Once you are done creating the affidavit by filling in the necessary fields, you need to first get your document printed on a stamp paper of the desired denomination and soon thereafter get the document concerned notarised by the notary public. Doing so is mandatory for your affidavit to be deemed admissible as permissible evidence in the courts of law. To create an Affidavit for Gap In Employment, you can place a request with us and our team of customer service executives will help you with the same. We can also print this affidavit on a stamp paper and deliver this to your address. 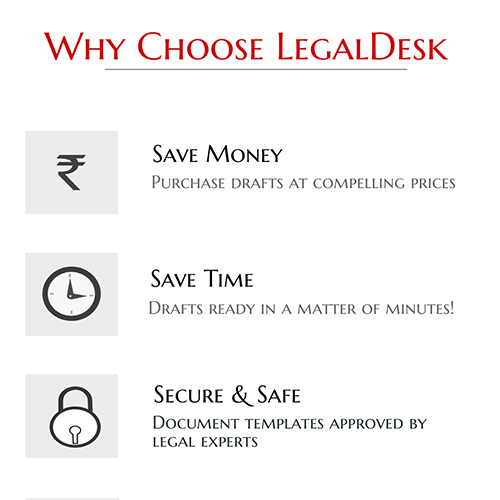 LegalDesk – A Do it Yourself Platform, Is Your Happy Place! Have a gap or so in employment and do not know where to go and what to do about it? Fretting over it too much and already losing sleep thinking about it and feeling depressed? Well, friends just calm down, as we are here to your rescue. You don’t have to feel worried about the fact that you will never find another job and that your gap in employment will become hard to manage and inexplicable. Just create the gap affidavit with us by filling in all the necessary fields and rest back and enjoy as we print it on a stamp paper of the requisite amount and deliver it to your doorstep. Well, while you are here already, why don’t you give our other legal documents and deeds – Will, gift deeds, rental agreements, power of attorney agreements – a look? Try creating any of the documents on our website and we will take care of the rest of the process. Own a startup or are you harbouring a dream of opening and owning one soon? Don’t know how to go about or the legal formalities that are involved? Well, worry not. You can now opt for our startup packages and we will offer a large number of startup related mandatory legal documents to you and that too at give-away prices. So, don’t wait anymore, just click and create and help us help you.